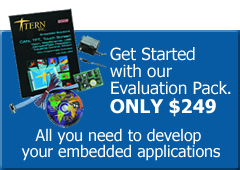 The MemCard(MM) from TERN provides a variety of functionalities to expand upon TERN controllers’ capabilities. It supports PCMCIA ATA type flash memory cards, 24-bit and 12-bit ADCs, and a 10BASE-T Ethernet interface. It provides a high performance mass data storage and general I/O expansion solution to many portable embedded applications. PCMCIA cards eliminate the problems of weight, power-consumption and reliability associated with electro-mechanical disk-based systems. A low power version VE+MM unit only consumes less than 5 mA in the standby mode. 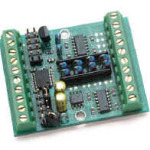 It is an ideal low cost, low power system for portable applications. With a 68-pin PCMCIA-ATA interface, the MemCard supports Flash cards up to 220 MB from SanDisk, and M-Systems. 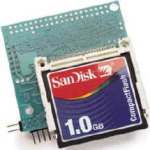 5V Flash memory chips (128/512 KB each) are also available for non-removable data storage. 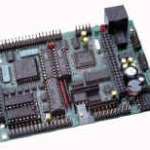 It provides I/O mapping access and interrupt support for PCMCIA I/O cards. These credit-card-sized 68-pin cards can be used as portable data carriers and provide a reliable and efficient method to transfer useful data or programs among embedded controllers, PCs, and different systems. With TERN’s software support, you can access any of the sectors within the Flash card memory. An optional ejecting mechanism is also available. Up to six 24-bit ADC (LTC2400) chips, each providing one channel of 0-2.5V analog inputs, can be installed. The LTC2400 is a 24-bit analog-to-digital converter with an integrated oscillator. It uses delta-sigma technology, providing a typical conversion time of 160ms. The MM uses a 2.5V precision reference (LT1019-2.5) for the 24-bit ADC. The LT1019 has a typical ultra-low temperature drive of 3ppm/C and a built-in temperature sensor. For applications that use thermocouples, the LT1019 can be used to measure board or ambient temperatures. Up to three TLC2543 chips can also be installed, providing a total of 33 12-bit ADC inputs. The 12-bit ADC has sample-and-hold, a high-impedance reference input, 11 single-ended 0-5V (or 0 to REF) inputs, and a 10 kHz sample rate while driven by a 40 MHz A-Engine. 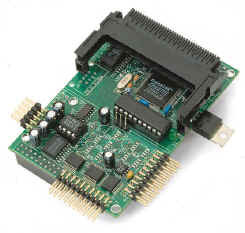 An Ethernet LAN controller (CS8900, Crystal Semiconductor Corporation) can be installed on the MM. The CS8900 includes on-chip RAM and 10BASE-T transmit and receive filters. The CS8900 directly interfaces to the TERN controller’s data bus, providing high-speed, full duplex operation. A standard RJ45 8-pin connector can be installed for the Ethernet LAN connection. Due to mechnical constraints, the Ethernet RJ45 connector and the 68-pin PCMCIA socket cannot be installed at the same time on the MM. A flat cable with an off-board Rj45 may be connected to the MM if the PCMCIA socket is installed. 3 24-bit ADC w/ 2.5V REF (up to 6) $20 ea. NOTE: If PCMCIA is installed, RJ45 must be off-board, connected via flat cable.